Newsmen traveling with Adlai Stevenson to cover his presidential campaign are nearly 6-1 in favor of the Democratic candidate, a poll of correspondents indicated Wednesday. However, despite their strong personal likes and dislikes, the newsmen accompanying the Illinois governor are not nearly so confident that he will lick Dwight D. Eisenhower in November. Only two newsmen would admit to placing or taking friendly bets with their fellows. Pulitzer Prize-winning Bert Andrews of the New York Herald-Tribune has wagered on Ike. "It's a sweep-in; it's all over," Andrews, considered one of the nation's top Washington experts told his fellows. 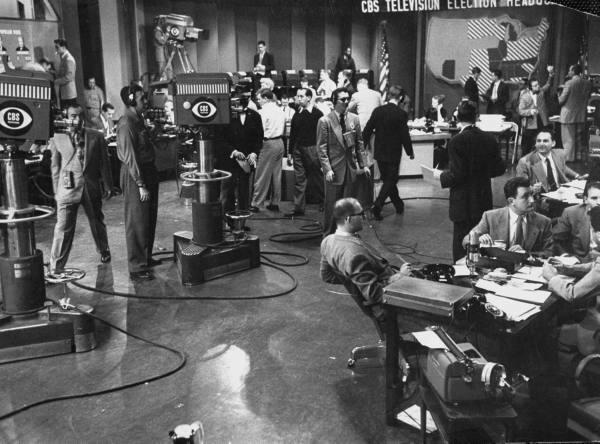 Bill Downs, ace CBS newscaster, who covered part of Mr. Andrew's wager, demurred volubly. "Mr. Stevenson took the initiative last week and this. 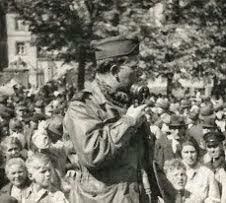 He is passing Eisenhower and will win the election," Mr. Downs held. According to the newscaster, the Republican candidate reached his peak vote-drawing capacity early in the campaign, began slipping more than a month ago, then climbed somewhat on the initial impact of the Richard Nixon speech concerning the vice-presidential aspirant's finances. "Now the Eisenhower 'pull' is declining again, while Gov. Stevenson is on the upgrade," he explained. Most members of the Stevenson press party, while declaring "at least 75 per cent of the group" now is pro-Stevenson, expressed belief "it's not our role to be quoted as individuals." However, Barnett Nover, syndicated Washington correspondent for The Denver Post, noted "the feelings of the men in the press party are directly related to the kind of news the candidate is making." He explained that members of the press contingent traveling with either candidate, especially those who have toured with both, "go for the fellow who makes the most news." According to Mr. Nover "the endless fertility of ideas and news phrases expressed by Gov. Stevenson puts many of us on his side." Several reporters who have traveled with both groups have pointed out, on the other hand, that "Eisenhower speeches have a way of being stilted, and even 'produce stuff' that seem to come from a word-factory." One curious split in the reportorial party was evidenced when correspondents Harold Lavine and Leonard Slater, both representing Newsweek, indicated sharp division on their personal preferences as to the candidates—but would not state who each favored. Several correspondents warned campaign observers not to be "deceived" about the situation in the south as regards Gen. Eisenhower's chances. "He will get the largest vote ever given a Republican down there, larger even than the anti-Al Smith vote," said one, "but he cannot come close to the 50 per cent he needs to capture southern electoral votes." Newsmen accompanying Gov. Stevenson were of one mind on one issue, however—being nearly 100 per cent in favor of train travel for presidential candidates. "You can leave town while you're sleeping," said one. "You have time to think through your stories on a train," another reported. "You fly 600 miles to ride in a bus," was another's bitter phrase. "This is the roughest campaign newsmen ever went through," was the general consensus.